Installation view of 'Office Party' in 'Office Sessions III' at Anchorage House, East India docks, London. Photo credit Louise Wheeler. Installation view of ‘Office Party’ in ‘Office Sessions III’ at Anchorage House, East India docks, London. Photo credit Louise Wheeler. 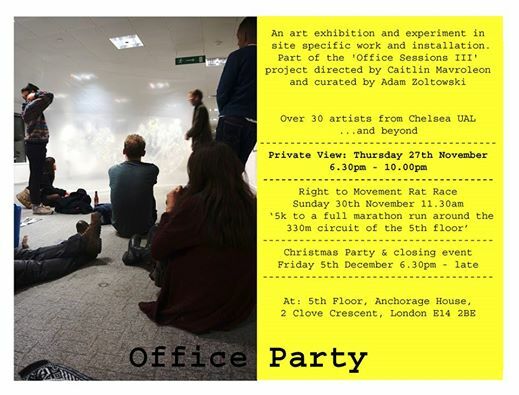 You’re invited to “Office Party”, a four-week art exhibition and experiment in site-specific work and installation on the 5th floor of Anchorage House, East India docks, London. The “Party” is part of the longer-term “Office Sessions III”, directed by Caitlin Mavroleon, a project exhibiting the work of over 140 artists, which takes place over floors 4 through 6 of this former business site. Ends 5th December 2014. There are office parties and then there is the “Office Party” going on now at Anchorage House in Tower Hamlets. Three floors of this former work place have been taken up for the “Office Sessions III” project directed by Caitlin Mavroleon, with the “Office Party”, curated by Adam Zoltowski, on the 5th Floor. “Office Party” began 12 November 2014 with a few early-arrivers, when “the art on its best behaviour” mingled politely with the others, as everyone sipped bubbly and waited for the real party to start. Work by Henry Gardiner. Installation view of ‘Office Party’ in ‘Office Sessions III’ at Anchorage House, East India docks, London. Photo credit Henry Gardiner. Work by Josephy Lichy (left) with Installation view of ‘Office Party’ in ‘Office Sessions III’ at Anchorage House, East India docks, London. Photo credit Adam Zoltowski. Around 40 artists Chelsea College of Arts or otherwise based in London are showing site-specific work at “Office Party”, with the exhibition evolving over its month-long run until the wee hours of the “Party”, when it ends 5 December 2014. At this 11th hour, viewers may “witness the devastation of the morning after” and it’s probably going to be like every other great party – the night may or may not be clearly remembered, yet everyone is pretty sure it was amazing! Michael Williams in front of his work. Installation view of ‘Office Party’ in ‘Office Sessions III’ at Anchorage House, East India docks, London. Photo credit Louise Wheeler. …an inter-zone. A heterotopia. A perfect vessel for the encounter with art because the best encounters are unexpected. A place for a show that exposes the conventions of behaviour that are so embedded as to be invisible.What else happens besides work in the workplace? Outside the norm when the conventions of behaviour are relaxed for a while. A ritual that acts as a pressure valve. Making the mundane tolerable. Making the mundane tolerable indeed but “Office Party” is so much more than that; it’s one not to be missed! To join the fun or to stay tuned on what’s happening, check out the “Office Party Blog” for updates! Caitlin Mavroleon’s “Office Sessions” is a long-running project that has seen three floors at Anchorage House serve as an arts/creative space for exhibitions, photography and film studios, fashion preview/run-way shows, and numerous other creative/arts events. Mavroleon’s primary aim with “Office Sessions” is to mentor young/emerging artists by offering a platform to show their work as well as the chance to gain experience in activities related to their creative careers (such as curation, networking with peers, and PR/marketing skills). Naz Moradi (l) and Francesca Ulivi (r) at ‘Office Party’ in ‘Office Sessions III’ at Anchorage House, East India docks, London. Photo credit Louise Wheeler. Kelise Franclemont, ‘Dreams of the Rat Race (No Exit)’, 2014, project digital video (2:37 mins looped), ‘Office Party’ in ‘Office Sessions III’ at Anchorage House, East India docks, London. Photo credit Louise Wheeler. Work by Nick Cheesman. Installation view of ‘Office Party’ in ‘Office Sessions III’ at Anchorage House, East India docks, London. Photo credit Louise Wheeler. As part of “Office Sessions III” floors 4, 5, and 6 of Anchorage House are taken up with the work of 140 artists in a variety of exhibitions, installations, events, and performances. Work by Rebecca Molloy, installation view of ‘Office Party’ in ‘Office Sessions III’ at Anchorage House, East India docks, London. Photo credit Louise Wheeler. “Office Party” is on the 5th floor, whilst “Office Sessions III” continues on the 4th floor with a variety of paintings and other 2-D/3-D work. On the 6th floor, a retrospective exhibition curated by Vanja Karas, founder of Photography Open Salon, shows a selection of works from two award-winning books “Transience” and “An Eye for an Ear”. On display will be a number of limited-edition prints, site-specific installations, photography, projections/video art, and other sculptural pieces related to these recently published books. Vanja Karas (ed.) with Foreword by Stuart Franklin, Magnum, ‘Transience’, 2012, Hardback: 220 pages, Printed by: ubyu bespoke books (online), Language: English. Adam Zoltowski in his studio. Photo © Stefan Lubomirski de Vaux 2014. Adam Zoltowski, the curator of “Office Party“, is pursuing his MA in Fine Art at Chelsea College of Arts and his sculptural work ‘Dirty Old Man’ (2012) was recently selected for Bloomberg New Contemporaries, showing at the ICA in London until 25 January 2015. Caitlin Mavroleon is Founder and Creative Director for on-going “Office Sessions” projects (Office Session II and III at Anchorage House in Tower Hamlets, East London) and is highly active in a number of organisations and projects that aim to support the career paths of creative people, with particular focus on mentoring emerging/young artists. To list a few of her current projects, Mavroleon is Creative Director to Art for Youth London, as well as serving as an Ambassador for UK Youth, and she is the curator of Get Up, Stand Up for Change gallery, which aims to “turn young people into leaders through arts”. Exhibition details: “Office Sessions III” is at Anchorage House, 2 Clove Crescent, E14 2BE (East India on the DLR). Please note there is also a performance piece by Kelise Franclemont scheduled on this date from 11AM, “Right to Movement Rat Race (an exercise in subjectivity and space)”, so look out for the marathon runners (and maybe stick around to cheer them on)! And remember, whilst there is such a thing as “fashionably late”, after the 5th of December, you’ll have missed the whole affair! Click to enlarge view/download Office Party Invite for 5 December 2014. 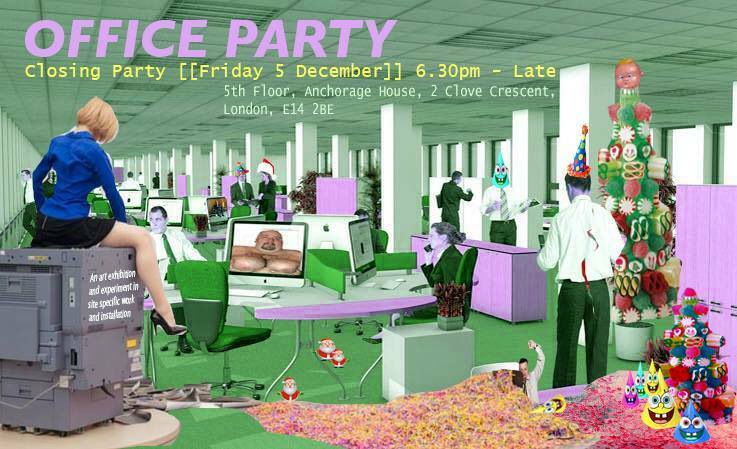 Around 40 artists from Chelsea College of Arts or otherwise based in London are showing site-specific work at “Office Party”, with the exhibition evolving over its month-long run until the wee hours of the “Party”, when it ends 5 December 2014. Kelise Franclemont, a multidisciplinary artist invites us, to visit Office Session III, an exhibition curated by Caitlin Mavroleon in East India Docks.